Dual-wavelength OTDR/Loss test set for both point-to-point and PON applications. Note: All OFL280 FlexTester models come with a carry case, (1) SC and (1) FC adapter for the OTDR/OLS port, (1) 2.5 mm universal adapter for the OPM port, (1) 2.5 mm universal adapter for the VFL port, One-Click Cleaner SC/ST/FC (2.5mm), USB cable (connects with Type A USB port on your PC), and AC power adapter with a country specific power cord. OFL280 FlexTester Multifunction OTDR and Loss Test Set The Noyes OFL280 FlexTester offers an unmatched combination of fiber optic test functions, ease-of-use, portability, and value. All OFL280 FlexTester models include an integrated single-mode 1310/1550 nm OTDR with PON-optimized and standard test modes, optical power meter, 1310/1550 nm laser source, and visual fault locator. 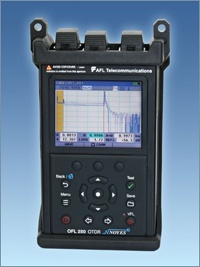 For many users the two-wavelength OFL280-100 will provide the best balance of functionality and value. Testing at 1310 and 1550 nm is normally sufficient to certify point-to-point or FTTx PON fibers and allows the detection of macro bends. The three-wavelength OFL280-101 and OFL280-102 models add 1625 nm or 1490 nm respectively. Testing at 1625 nm allows testing of the L band. Testing at 1490 nm is required by some network operators to certify FTTx PONs. The filtered, three-wavelength OFL280-103 can certify dark fibers at 1310/1550 nm, fault-locate live FTTx fibers at 1625 nm, and measure FTTx power levels at 1490 and 1550 nm, all from a single test port. The OFL280 FlexTester user interface provides operating modes suitable for a wide range of users and features a top-down menu structure that is both easy to learn and a pleasure to use. OTDR test results may be saved as industry standard SOR files, which can be transferred to a PC for viewing, printing, and analysis using supplied Windows® compatible software. FTTx customer fiber troubleshooting – dark fibers (hard faults) – Locate cable cuts, open splices, and bad connections. When ordering, specify model, OTDR port ferule type. Request a full pdf spec of this product from. We rent and ‘lease to own’. We also take trade-ins. See our Noyes Store. Warranty: This brand new unit comes with a full 1 year Noyes factory .